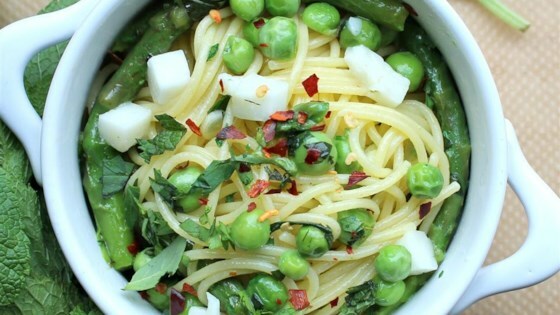 "Mixing herbs like mint and basil with asparagus and peas creates a tasty summer dish. This is one of my favorite things to eat on a hot summer day! Goes great with grilled salmon and a glass of crisp Riesling! Chop herbs in a food processor to speed up your preparation time." Fill a large pot with lightly salted water and bring to a rolling boil. Stir in the fettuccine, bring back to a boil, and cook pasta over medium heat until cooked through but still firm to the bite, about 8 minutes. While fettuccini is boiling, place asparagus and peas into a steamer insert and place insert over the pot of fettuccine. Steam vegetables until tender, 6 to 8 minutes. Remove steamer insert and drain fettuccine. Combine fettuccine, asparagus, peas, basil, mint, parsley, feta cheese, scallions, and olive oil together in a large bowl. Season with salt and pepper. I have made this recipe as it is unlike the other reviewers. I love it just the way it is. Delicious. Only the food processing of herbs takes a little time. Interesting flavors here. I didn't care for the cheese though. Without the cheese, for me, this is 5 stars. Add some hot peppers to give it a kick, you won't be sorry. Thank you for the recipe. Pretty good. Added some chicken so it was more of a meal. This turned out great! Summer in a dish! I upped the herbs and spices a bit. Made it just as is. Excellent!